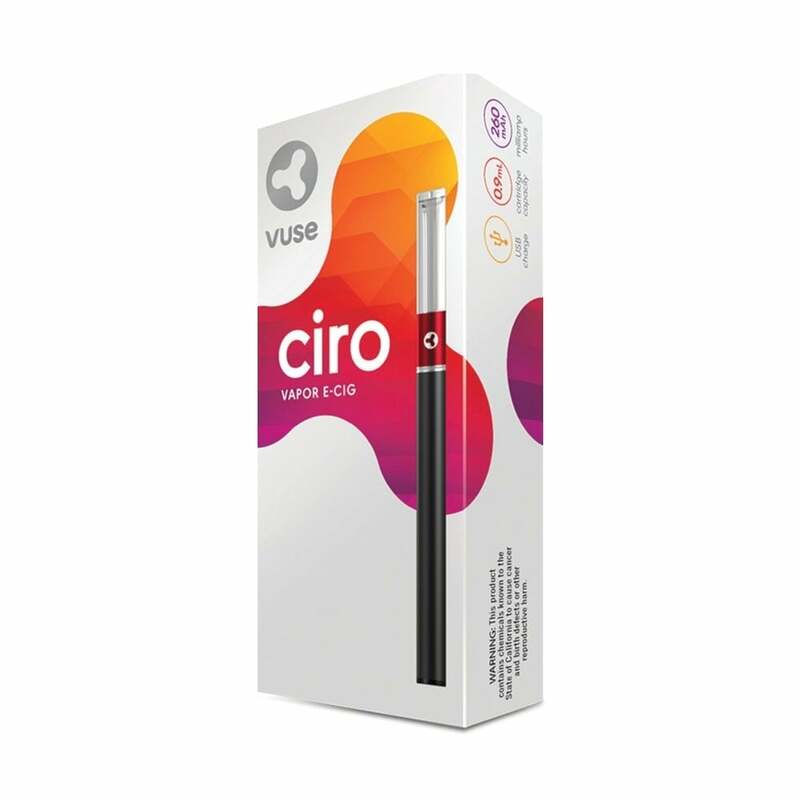 A new and exciting addition to VUSE’s e-cigarette range, the VUSE Ciro combines simplicity with user-focused design and a range of useful features, making it a great option both for first-timers and more experienced vapers looking for convenience, style and a smooth vaping experience. The VUSE Ciro is a slim, highly portable e-cigarette with convenience at the forefront of its design. Just like the VUSE Solo before it, the Ciro has a classic cigarette shape, though it builds upon the Solo’s design in various ways. VUSE Ciro cartridges hold 0.9ml of V-Liquid®, over 40% more than the Solo, and, taking inspiration from the tank system used in the VUSE Vibe, they are transparent, allowing you to see exactly when you need to replace them. A long-lasting ceramic wick takes the place of the fibreglass wick used in the Solo and the Vibe, giving you a smooth, flavor-packed draw, while the new ‘twist and go’ connection between the battery and cartridge allows you to change cartridges with a minimum of hassle. The VUSE V-Liquid® contained within the cartridges is expertly blended in the USA and contains 1.5% nicotine (15mg nicotine) for a perfectly smooth and flavorsome vape. The VUSE Ciro is powered by a 260mAh battery, which can be recharged using the USB cable included in the kit. The LED will fade and glow white as you draw on the e-cigarette, and will flash red ten times when the battery needs recharging. Refill cartridges for the VUSE Ciro are available in Original (Tobacco), Nectar (Summer Fruit), Melon, Mint and Menthol, giving you a whole range of refined flavor options to choose from, whether you’re a fan of classic tobacco blends, refreshing fruit or cooling mint and menthol liquids. Great taste, made me an ex-smoker! I've used a lot of e cigs and this one is by far the worst. I counted the hits for my battery. I get ten. And it takes an hour to charge it. Poor selection in flavors (why can't they have the "Crema" flavor for the Ciro), and the cartridges are now ridiculously expensive and run out too quickly to boot compared to other brands. Hopefully, this company will get its act back together...? It sounds like I am not the only loyal customer who has become unhappy. No longer worth it since the five dollar overnight price increase. Didn't the Reynolds company just get a tax cut worth millions of dollars? I will never buy another product from this company again. The $6+ price increase over the last month will prevent me from purchasing Ciro Vuse any further. They don't last as long as the should for me to spend $15+ for a pack of cartridges. Shame, they DO have the best taste. I have been buying Circo vuse for about 1 1/2 years and in the past couple weeks it went up 7 dollars...what the hell is going on with that. It's just like buying cigs. What is the reasoning for this besides money hungry, and taking advantage of people. I won't buy it anymore it's just to expensive now I mean a 50% increase in less than a month crazy. Obviously you don't care and want people to move on to a different product. I think it is just insane to raise it that much. Decent tasting product, I wish the charge lasted a bit longer. Product works ok , battery lasts about a day , not as good as the Vuse Vibe . Worst ever. I switched to this after Vibe was removed. Very expensive, the cartridges are too expensive and the batteries last MAYBE a couple hours. They need to bring the Vibe back. I’m not wasting any more money on Ciro! It helped me stop smoking cigarettes. It lasted only a week. The pen does not light up or do anything. Save your money. Bought 1 just the other day with 2 pack of refills. Can’t tell if the pen is defective or the refills. Pen lights up but nothing comes out. As well as the tank it came with LEAKED! not a good value. tanks do not last. Either lower the price or give 4 tanks per pack. a customer for over two years. they always make it right when i have a problem...but ciro, i am disappointed in. The cartridges are way too expensive. They work well but even the promotional price was too high. I was using them waiting for a replacement vibe to hit the market, now the promo price has gone so I will not be buying another. I got this ecig yesterday and it works perfectly fine. I got the ecig for 7.99 and a catridge pack for 8.99 that comes with 3 of them. When the vuse refills only came with 2. All you have to do is hit it slower to get a nice draw off it. It doesnt' make big clouds, but its a nice ecig. My liquid is half full and im having no problems. I bought this as a replacement for my Vibe that has been recently recalled. I knew beforehand that it wasn't as big as the Vibe, but I wanted to give it a try. I am not impressed. It's just ok. I was hoping that it would last longer than the original Vuse, but it doesn't. In fact, the cartridges don't even seem to last as long as the Vuse, and the battery definitely doesn't last as long. I've actually found that I prefer the original Vuse to the Ciro. Quite disappointed to be honest. Been using this product for a couple months - since the Vuse Vibe was discontinued. I genuinely hate this device. The battery easily dies within less than a day; without any warning that it is losing power. The cartridges will leak hot oil into your mouth, burn your lips. The cartridges will barely work after being about 1/4 full. The cartiridges do not last long unless you “economically puff”. The quality is very poor for the price. I would never recommend this product.